Are Green Waste Diversion Efforts, Actually Harming the Environment? Over the past 40 years (the length of my career up to this point), lawn clippings have been given a negative image because of their effects upon landfills prematurely reaching capacity. Farmers have been asking me this entire time, "Why are landscapers throwing away all of those grass clippings?" Grasscycling, mulching and Don't-Bag-It campaigns became popular in the 1990's and university research was twisted to make mulching mowers more appealing by adding an economic incentive by stating that a homeowner could buy one or more less bags of fertilizer if they grass-cycled. Keep in mind, the ultimate goal was to sell more mulching mowers. Mulching mowers were just too expensive and grass clippings continued to be buried in our landfills. In response, composting yards were added to landfill sites. Regardless of all the campaigns and advertising efforts, the love affair with composting is slipping in support (and not a moment too late) because it's not profitable. According to the US Census, composting facilities have been decreasing since 2006 because they are not profitable and can't even pay their own way without the tax payers help. I see more and more landscapers returning back to bagging their clippings because mulching or grasscycling leaves lawns less manicured with clumps of grass everywhere during high growth periods or when the lawn is wet with dew. Lets not even talk about all the clippings that get brought into the house by our pets or children. On the lawn health side, an alarming increase in the incidence of lawn diseases have increased as mulching mower sales have increased as I look back on my 40 year career. 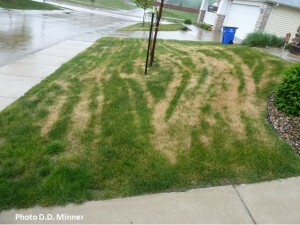 Mowing companies get blamed for spreading lawn diseases across a clients lawn from the front yard to back yard or worse yet, from an infected lawn to their next customers healthy lawn. This practice has increased the number of infected lawns resulting in more lawn fungicides being applied to the environment. What is Green Waste Diversion? These days, "Diversion" is the new name of the landfill game. 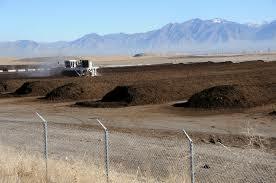 If lawn clippings are composted at the landfill and the compost is moved off site, it is considered diverted waste. When tree limbs, old pallets and lumber are ground into mulch at the landfill and then loaded up and spread on a nearby farmers field, it is considered diversion. There's also this term Allowable Daily Cover (ADC) that allows landfill operators to spread a few inches of lawn clippings across the packed down trash that day as a night-time blanket creating this trash-grass-trash sandwich, and this is also credited as diversion. There is the scattering of green waste offsite to crop land that also gets the diversion nod, and last there is bio gas production from lawn clippings but that seems to be inefficient. Are Composting Sites Contaminating Ground Water? A chink in the armor of composting and mulching was published in an article by Waste360 and 27East.com last week titled "New County Study Links Groundwater Contamination With Mulching Operations" (, My takeaway from this actual report and I quote, "A new Suffolk County Health Department study links groundwater contamination with mulching and composting facilities on Long Island." Furthermore, the report is based on groundwater samples taken at 11 different sites across Suffolk County, including two on the South Fork—in Speonk and Eastport. Additionally, 19 different pesticides were found “at relatively low concentrations at a majority of the sites". I always love a new selling point of ensiling grass clippings as opposed to composting them that doesn't include the fact that it costs more to produce the compost than what it can be sold for. Composting is just another welfare case diversion solution. The composting process doesn't breakdown pesticides very well. But there is a promising new process to divert green waste that will actually breakdown and degrade those 19 pesticides that were responsible for contaminating private water wells down gradient on Long Island. Grass clippings that are contaminated with pesticides are packaged with the BioPac'r and allowed to ferment or ensile, those compounds can breakdown and degrade. This happens because the lactic acid that is produced in the anaerobic environment drops the pH down to 5 and a few other incredible chemical reactions are taking place inside our bag. This acid concentration is what pickles the grass clippings, the same way that vinegar pickles cucumbers. The ensiling process effectively decontaminates pesticide tainted grass clippings (and corn chopped for silage), creating a very safe and valuable cattle feed that can be sold to farmers and ranchers in the same way hay bales are sold. When it was discovered that landfill operators in California were increasing their ADC diversion rates (not in accordance with the law) by over applying from a few inches of lawn clippings to a few feet, legislators took action! More pressure was applied to contractors to not only divert 50% of their green waste by 2017, they now need to divert 75% of all green waste by 2020. Over the last few years green waste has started to be scattered over farmland fields so they can get credited with diverting green waste. Again, problems are surfacing in connection to all the paper, cans and non-organic waste that gets mixed in with the grass clippings, cluttering up the fields to the point where these fields are themselves resembling a mini-landfill. In response as you would expect, farmers have begun to refuse the free organics, resulting in the production of more worthless, contaminated compost that is apparently capable of contaminating ground water of water wells down gradient of the composting site if allowed to infiltrate down into the soil profile. By 2050, the World Food Organization and the United Nations have determined that our world food production must double to feed our climbing populations and this task is really placed upon the USA. This is a real problem, Chairman of the Board, Eric Schmidt of Google along with DuPont, Agco, UTC’s Sensitech, 3D Robotics, Innovation Endeavors and Flextronics Lab IX have formed the Farm2050 project. Grants were offered to give seed capital to startup companies that can help with this food challenge. They offered all these space age, fancy categories to apply under but the BioPac'r never heard back from their representatives after the initial submission. They didn't offer a category for "Common Sense Solutions" so I must conclude after 15 months, that my application got tossed? When the BioPac'r is put into the hands of landscapers, golf course professionals, this green waste is diverted at the source. Landfill contractors and waste haulers will never have to touch it and if they want to capitalize on this new diversion technique and want to generate some serious revenue, I'd recommend you contact Yellowstone Compact & Commodities Corp for your free business plan that we have created. Email me at info@biopacr.com. In the 21st century, lawns need to be viewed as the invaluable crop that they can become and not as a problem. Lawn mowing and maintenance companies will become "Lawn Harvesting" companies, and Grass Clipping Silage™will become the idea that can and will double our livestock herd size nationally, without ever putting another acre of land into production. We will not have to invent more GMO', crops or robotics to produce more safe food, We won't have to remove lawns so we can conserve water. Grass clipping silage is not intended to replace other forages crops, it complements them and at the same time, helps small farmers to manage their "RISK", by stabilizing hay prices in drought years. This new feed supply would allow young people or new farmers to enter the cattle feeding business without needing to own the ground to grow their feed. They can just team up with their local landscaper, rent a little farmstead and they are in business. This is what I call a "Rural Renewal" campaign. Captured within a 1-ton bag of ensiled grass clippings is 165 gallons of reclaimed irrigation water. 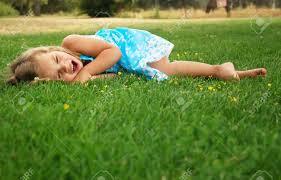 Lawn clippings are 90% water and the water is locked up in th grass blades until the water evaporates. 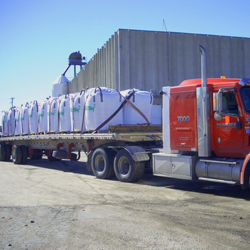 The BioPac'r packages freshly harvested clippings into a poly lined bag that doesn't allow the water to evaporate. When cattle eat wet feed they drink less water. Turfgrass can still be used used for recreation, but after you package it, it ferments into a livestock feed source, homeowners will be able to have their lawns and feed them too. Thirty-five (35) millions acres of lawns cover the United States making it the #1 irrigated crop, surpassing irrigated corn by three fold according to NASA satellite mapping. These 35,000,000 acres of lawns could provide 500 million tons of cattle feed and 150 billion acre-feet of reclaimed irrigation water each year. That's enough water to supply 150 million people with their annual water allotment. Or more practically, that 150 million acres feet of water that doesn't have to be offered to cattle in feed lots if they eat Grass Clipping Silage. Or that's 150 million acre feet of water that wasn't used to irrigate a hay crop that is fed to animals all dried out. However you want to look at it, the irrigation water locked up in Grass Clipping Silage™ has some serious value, economically and socially. It is becoming very clear that the old ways of diverting green waste may be harming our environment and costing us economically. Viewing grass clippings as the Rock Star that they are, is the future of the turfgrass industry and the solution to our landfill problems, as well as the food and ground water issues facing us. It may take you a few days to wrap your mind around an entirely new commodity market, and waste reduction system, but I have faith that we will not be closed-minded and that we will do whatever it takes (when obstacles get in our way) to fulfill the new destiny of grass clippings.